If you’ve ever entered a corner in mild panic or found yourself drifting wide uncontrollably, and let’s face it we all have, you’re a prime candidate for the famous California Superbike School. In one thrilling and extensive day, the school will help you understand why you get things wrong, how to do it right and will make you a much better rider. In fact, you will probably be almost unrecognisable from the rider who turned up in the morning. I took the Level 1 course at Rockingham. It was only my second time on a track so really I was a complete novice on the track and very nervous. But that doesn’t matter because Level 1 is all about teaching you good riding skills and habits that apply equally to road and track, and equally to experienced and new riders. The day is structured around six drills, each lesson starting with theory in the classroom followed by practice on the track. 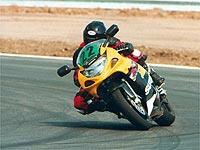 An instructor is allocated to you and stays with you for each of the track sessions throughout the day. He follows you around the track, pulling you into the pits whenever necessary to give you guidance on how to do the drill better. Lesson one is throttle control round the corner – the theory being that in order to maintain a line round a bend once you have turned in, you have to steadily continue opening the throttle to maintain an even distribution of weight between the two wheels. This, like all the other drills you learn, may be counter-intuitive for your body. When the classroom instructor asked who had ever entered a corner too quickly, panicked, backed off the throttle and suddenly found themselves running even wider, pretty much all hands went up. This drill helps you get on the throttle fast after turning in and then open it steadily through the bend to give you maximum control of the bike. To encourage you to learn throttle control fast, you do this drill (and most of the day) in fourth gear only and using no brakes. Each drill builds on the next, so next the turning-in points were marked on the track and the idea was to turn on them exactly (and then get on the throttle fast). This may sound easy but the lesson is judging the speed you are approaching the corner at so turn at the point you aim for and not end up turning too early or too late. Top racers are supposed to judge their speed to within 1 or 2 mph on entry into a corner. After a basket of chicken and chips for lunch, we tackled counter-steering. This is something we all do unconsciously to lean the bike – here they teach you to do it consciously and in a controlled way. The idea is to make the bike turn very fast, so that you can put the bike on the right line quickly and then ride round the corner with the weight balanced across both wheels. There’s a drill in the paddock first so that you can practice this at low speed before you go out on the track as it is very unnerving. The results are amazing. Your bike, whatever you are riding, will drop on its side faster than you would believe. Relaxing while doing all of the above is not easy on your first day, but that is the next drill. Having a relaxed upper body allows the bike to self-correct if it hits a bump or the back wheel starts to go. If you’re tense, you stop the bike self-correcting and it is a whole lot less stable. To prove you’re relaxed while turning in late, counter-steering hard and opening the throttle through the bend, you dance the funky chicken while you’re doing it. The minute you stop waggling your elbows, your instructor appears out of nowhere and puts you straight. The funky chicken may not be an advisable look but with relaxed elbows you will feel the extra stability instantly and so you’re happier going much, much faster. To complete the list of things that feel completely wrong but work amazingly well, we learnt a visual drill. We all know that you should look where you are headed for, that means the apex of the bend you are turning into. Well, the Superbike School makes you look earlier, that means looking at the apex before turning in. Sound easy? Well imagine aiming at gravel at 60 plus mph with 30 yards of track to spare, turning your head away to look 70 degrees to the right (where the track goes), then pushing the bars hard in the opposite direction to the bend, then immediately opening the throttle – all while doing the funky chicken. Not easy, actually. But when you get it right, it feels so fast and so good, you’ll be wondering how you ever enjoyed biking before. All the instructors are trained to teach in a very specific way, which is direct and precise. My instructor, Pete, was nothing short of inspirational, dragging me in to the pits, looking me straight in the eye and running through with me what the drill should be, what I was doing wrong, and how to fix it. I gained enough improvement and increased awareness to be ready to fork out again for to do Level 2 later this year. There is also a level 3 course. You can only do the two after doing one, and three after doing two. Anyone who has taken the training can join in ex-students-only track days, too.